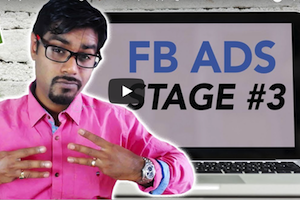 Today we reveal Stage 3 of our Proven FB Ads Strategy! Stage 1 covered the Facebook Advertising basics for you. Stage 2 was all about finding your winning ad sets. And finally, stage 3 will scale your ads! The Shopify Facebook Ad strategies you’re learning today are more than capable of taking your business to $10k monthly revenue. For this to work properly, we need you trust these strategies. We’ve spent $10’s of thousands of dollars in order to discover the strategies working right now in 2018. Focus on 1 Shopify facebook ads strategy at a time so you can prove to yourself, exactly what works. By following our stage 1 and 2 videos, you should be able to identify at least one profitable product and ad set. You can implement our 4 Phase Approach to scaling! This increase or decrease should happen every 48 hours. Only update the Facebook Ads daily budget between 12am-5am. The date range for checking the ROAS (return on ad spend) is the past 7 days. This phase begins as soon as you identify your first profitable ad set. The first thing you’ll do is duplicate the profitable ad set. Only modify the budget of the duplicated ad. And after you spend $15-$20 per ad, check on your data. If your ROAS is greater than 3x times your spend, duplicate that ad. Continue this trend for each consecutive winning ad. So for instance $10 daily ad spend is duplicated and changes to a $20 dollar budget. And if that new ad with the $20 daily budget does well, it will be duplicated and the new budget will become $40. Phase works in sync with Phase 1 and Phase 2. Duplicate the winning $5 ad from Stage 2 and simply modify the interests. We suggest creating 3 new ad sets per day, following our First Sale Chart along the way. The goal is to identify 4 profitable ad sets. Once you do, simple implement Phase 1 and Phase 2, again. Implement phase 4 once you’ve reached 20 purchases of a product. Once you reach the 20 purchase threshold for that product, create two new audiences. Now that these two new audiences are created, create 1 ad set for each audience. Then create 2 ads for each ad set. There are plenty of strategies to continue scaling your business beyond $10k per month. Start with these and keep an eye out for our upcoming posts. P.P.S. Click here for Episode 25! Hi rito.. I followed Stage 1 and 2 just like you said but I did not get any Add to Carts from any of the 3 ad sets. I am gonna try new interests now. Should I make a new campaign for that or should I change the interests and continue with the old one? Also please suggest what should be my next move? I didn’t understand your 10% rule quite well. Now the confusion starts here. You said the increase or decrease shall be done every 48hours. If ROA>3 Increase or else decrease. But you also said the ROA has to be checked for Past 7 days. Lets say Day-1 (after finding winning adset)increased my budget by 10%. Day-3 ,Now what shall I check ROA of Past 7days or ROA of these 48 hrs. The last 3 days ROAS is what counts the most.